Like most children, mine enjoy doing art projects- painting in particular. However, like a lot of Mamas, I tend to shy away from letting them paint too often simply because it can make quite the mess. Mess on the floor, mess on the table, mess on them, MESS. It seems that one company may have the answer to that problem. The Pencil Grip, Inc. has created paint in glue stick form. 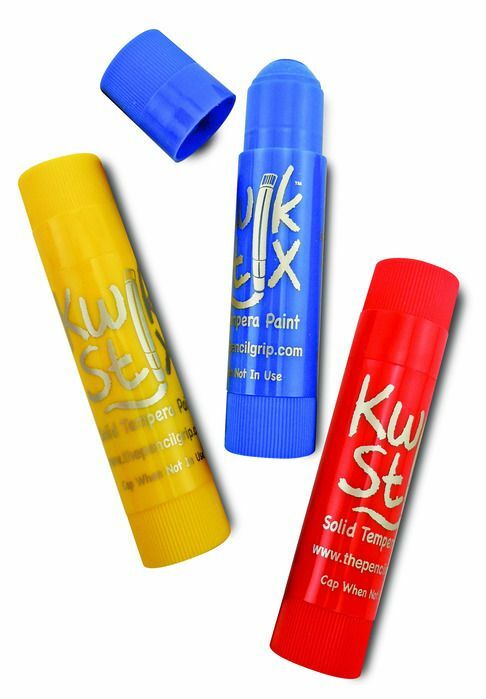 We received two Kwik Stix 6-packs: the Kwik Stix METALIX Solid Tempera Paint, and the Kwik Stix NEON Solid Tempera Paint for review. They require no water, no brushes, and only 90 seconds to dry. Yes, you read that right, 90 little seconds. No more saturated paint papers laid all over the dining room table. In general, by the time your child is done painting, they are ready to be hung with pride. Also available is the Kwik Stix 12 pack. As soon as we received our Kwik Stix, the kids couldn’t wait to get them out of the package and onto paper. Immediately I noticed that the paint sticks are super easy to use. They’re big enough for little hands to handle them easily. We also received some neat pencil grips. They are super soft (unlike some much harder ones I’ve used with the kids before). Be sure to check them out! sounds like a good product, you wrote a good review.